Natural rust isn't very pretty though, especially the kind that you are probably most familiar with, rusty old cars. Fortunately, that oxidation can be controlled by the artist to make something beautiful. A bronze sculpture can be beautiful for many reasons, the subject matter, the bold graphic shape, the way the light catches subtle details. It can also be beautiful because of the color. The color can not only be the strongest factor in the appeal, but it can also enhance and draw out the subtle shapes. I have often heard the question "The color of that bronze statue is so rich and colorful, what kind of paint do you use?" Yes, the bronzes can come in many different colors, but bronze sculptures are not painted. The color comes from what is called "patina". But what exactly is a patina, you might ask? Thanks for asking! The patina on a bronze is not paint or dye or any other kind of applied coating. It is the metal itself, altered through a process similar to oxidation. Patina is a surface texture of various chemical compounds which may include oxides, sulfates, carbonates and sulfides, which come from the metal itself, as a result of a chemical reaction. On a sculpture, this chemical reaction is deliberate and controlled. Rust on a piece of iron is a form of patina. There have been many modern sculptures made from iron that sport that patina. It is a natural process that happens without any direction. The chemical reaction is between the metal, iron in this case, water and oxygen. This reaction can be manipulated using various chemicals, specific to the type of metal, to bring out different colors. Heating the metal activates the chemical process and also speeds it along, achieving the color in a matter of minutes instead of days or weeks as with natural "rusting". If bronze is allowed to oxidize naturally, it will obtain a greenish color. I'm sure you have seen the greenish streaks on outdoor bronze statues, that continue on down across the concrete base. The chemical reaction creating the patina is etching away the metal, allowing it to run down as a result of exposure to rain. The other patina color you most likely have seen is the classic brown. The brown patina has been a popular color for centuries, and is still widely used because it adds a deep warm richness to the sculpture. In modern times the range of patinas has grown greatly, to help make sculptures stand out from the crowd. Variety is the spice of life, after all, so why not? Since there are a wide range of colors, and patterns of colors, available, I choose colors that complement the sculpture and it's mood, that help accentuate the character. Some are true to the color of the character that inspired the piece, some of the patinas just add the right richness or style. The color should also help bring out the sculpture's form. A piece with a high level of surface detail should have a more solid color, so the variations in color do not compete with the surface shape. This allows the lighting to highlight the subtle shapes. A piece with long flowing lines unbroken but surface texture can have a more complex variegation of color to give it heightened interest. Those large smooth areas of the sculpture can be more like a canvas. The patina can also enhance the surface detail. Crevasses can receive a darker color than the smoother areas, making them stand out. The patina might be buffed off in raised areas. This can lighten the color or even bring out the raw metal color to create strong highlights. Since the patina is simply an oxidation of the surface, this oxidation can continue naturally. That's what you see on most outdoor sculptures, and any unpainted metal left outside for any period of time. The problem with this is that it will continue "naturally", not necessarily in the manner that the patina was applied to the sculpture. And like everything else, extended exposure to sunlight can alter the color of a bronze sculpture. The ultraviolet light can darken the color of the patina. To protect the patina, a protective coating is applied. This is usually wax, the same wax that you apply to your car's paint. And it has the same purpose, to seal the surface for exposure to air and moisture, as well as any other surface contaminants that may happen along. Just like wax on automobile paint, it will also deepen and richen the color. Clear coat paint can also be applied for pieces that will be place outdoors. This can protect the surface for many years. It can also bring the sculpture to a high gloss. 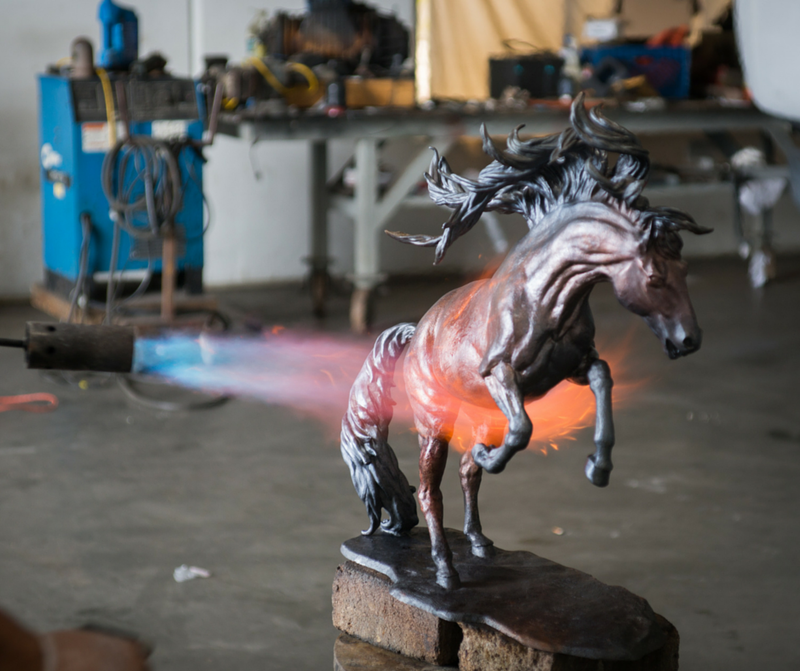 So the next time you see a sculpture with a bright and rich patina, or an intricate pattern or color, you will have an idea how that was accomplished. It is a natural part of the metal that is directed by the artist to enhance the beauty of the sculpture.